Christmas is almost upon us, and so it’s a short week at Seanchai Library in the run-up to the holidays – but there is still time for some fabulous story-telling in voice, brought to our virtual lives by the staff and volunteers at the Seanchai Library. As always, all times SLT, and events are held at the Library’s Second Life home at Bradley University, unless otherwise indicated. You’re about to meet a hypochondriac. Witness Mr. Walter Bedeker age forty-four. Afraid of the following: death, disease, other people, germs, draft, and everything else. He has one interest in life and that’s Walter Bedeker. One preoccupation, the life and well-being of Walter Bedeker. One abiding concern about society, that if Walter Bedeker should die how will it survive without him? So opens the 6th show in the very first series of Rod Sterling’s The Twilight Zone, one of the original three episode ideas used by Sterling to pitch the series concept in 1959. Already labelled a hypochondriac in that opening narration, we follow the mean-spirited Walter Bedeker as he seeks to make a water-proof contract with the devil himself (appearing in human form under the disarming name of “Ted Cadwallader”) which will allow him to sell his soul in return for health and immortality. With every “t” crossed and “i” dotted, the contract seems perfect for Bedeker, wary of any conniving tricks on the part of Old Nick. So why is the Devil so accommodating to Bedker’s demands, and why does he, in what appears to be a turn of altruism, offer Bedeker an escape clause, allowing him to choose the time of his death if he tires of being immortal? Join Gyro Muggins as he once again takes into a journey into The Twilight Zone. Aoife Lorefield reads Dylan Thomas’ timeless classic poem, and other tales of Christmas. A Seanchai Holiday Tradition of stories and poems (some original works) with the Seanchai Staff. I’d like to wish the staff and volunteers at Seanchai Library every best wish for the season and for a successful 2016. Thank you for your continued work in bringing stories and the spoken word into Second Life in the tradition of the seanchai, and raising awareness of literature as an art in-world. Looking forward to working with you throughout 2016, and to establishing Storytime at the Park with you as well! New Horizons is still less than half way through transmitting the data gathered during its fly-past of the Pluto-Charon system in July 2015, but the wealth of information received thus far has already revealed much about Pluto and its “twin”. Geological evidence has been found for widespread past and present glacial activity, including the formation of networks of eroded valleys, some of which are “hanging valleys,” much like those in Yellowstone National Park, Wyoming. 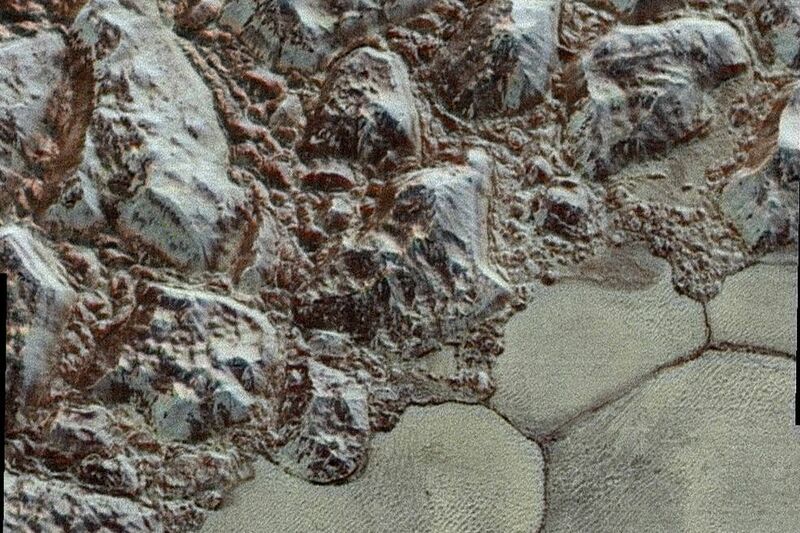 A major part of this activity is occurring in and around “Sputnik Planum”, the left half of Pluto’s “heart”, a 1,000 km (620 mile) wide basin, which is seen as key to understanding much of the current geological activity on Pluto. Images and data gathered for this region has given rise to new numerical models of thermal convection with “Sputnik Planum”, which is formed by a deep layer of solid nitrogen and other volatile ices. These not only explain the numerous polygonal ice features seen on Sputnik Planum’s surface, but suggest the layer is likely to be a few kilometres in depth. Evaporation of this nitrogen, together with condensation on higher surrounding terrain is believed causing a glacial flow from the higher lands back down into the basin, where the ice already there is pushed, reshaping the landscape over time. 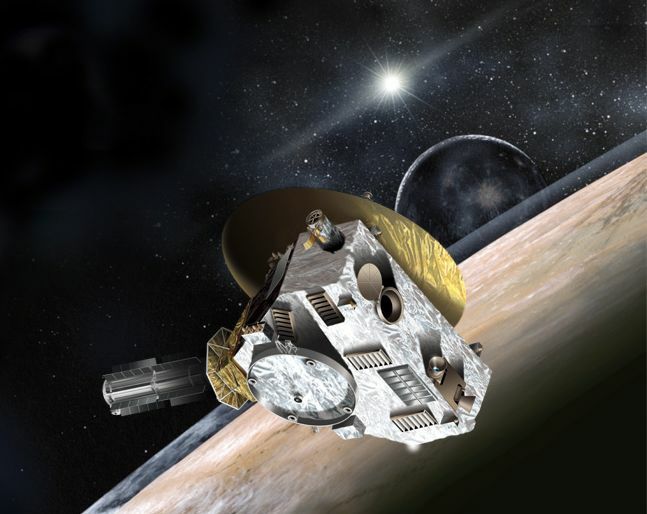 More data and images have also been received regarding Pluto’s atmosphere, allowing scientists start to probe precisely what processes are at work in generating and renewing the atmosphere, the upper limits of which are subject to erosion by the solar wind, which strike Pluto at some 1.4 million kilometres per hour (900,000 mph). As well as understanding the processes which are at work renewing the atmosphere, and thus preventing it from being completely blasted away by the solar wind, science teams are hoping to better further why the haze of Pluto’s atmosphere forms a complicated set of layers – some of which are the result of the formation and descent of tholins through the atmosphere – and why it varies spatially around the planet. In July I covered some of the work going into investigating the mystery of silica on Mars. This is a mineral of particular interest to scientists because high levels of it within rocks could indicate conditions on Mars which may have been conducive to life, or which might preserve any ancient organic material which might be present. In addition. As I reported back in July, scientists have been particularly interested in the fact that as Curiosity has ascended “Mount Sharp”, so have the amounts of silica present in rocks increased: in some rocks it accounts for nine-tenths of their composition. Trying to work out why this should be, and identifying the nature of some of the silica deposits has given rise to a new set of mysteries. The first mystery is trying to understand how the silica was deposited – something which could be crucial in understanding how conducive the environment on “Mount Sharp” might have been for life. Water tends to contribute to silica being deposited in rocks in one of two ways. If it is acidic in nature, it tends to leach away other minerals, leaving the silica behind. If it is more neutral or alkaline in nature, then it tends to deposit silica as it filters through rooks. If the water which once flowed down / through “Mount Sharp” was acidic in nature, it would likely mean that the wet environments found on the flanks of the mound were hostile to life having ever arisen there or may have removed any evidence for life having once been present. If evidence that the water was acidic in nature, then it would also possibly point to conditions on “Mount Sharp” may have been somewhat different to those found on the crater floor, where evidence of environments formed with more alkaline water and with all the right building blocks for life to have started, have already been discovered. The second mystery with the silica is the kind of silica which has been discovered in at least one rock. Tridymite is a polymorph of silica which on Earth is associated with high temperatures in igneous or metamorphic rocks and volcanic activity. Until Curiosity discovered significantly high concentrations of silica in the “Marias Pass area of “Mount Sharp” some seven months ago – something which led to a four month investigation of the area – tridymite had never been found on Mars. “Marias Pass” and the region directly above it, called the “Stimson Unit” show some of the strongest examples of silica deposition on “Mount Sharp”, and it was in one of the first rocks, dubbed “Buckskin”, exhibiting evidence of silica deposits in which the tridymite was found. The question now is: how did it get there? All the evidence for the formation of “Mount Sharp” points to it being sedimentary in nature, rather than volcanic. While Mars was very volcanic early on in its history, the presence of the tridymite on “Mount Sharp” might point to volcanic / magmatic evolution on Mars continuing for longer than might have been thought, with the mineral being deposited on the slopes of the mound as a result of wind action. Or alternatively, it might point to something else occurring on Mars.